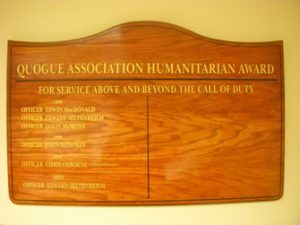 The Mission of the not-for-profit Quogue Association is to foster the general welfare of the Village of Quogue and preserve its character as a desirable and attractive residential community, to support organizations that strengthen the quality of life in the Village and to acknowledge the accomplishments of individuals and groups whose actions have contributed to the welfare of the community. We host speakers on important issues for Village residents that include such topics as beach erosion, taxes, the environment, health care and more. 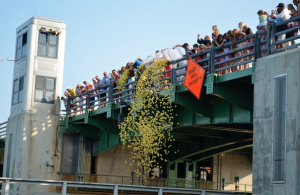 Join hundreds of your Village neighbors at our annual duck race and family beach parties. When necessary, we are proactive on issues such as the expansion of Gabreski Airport where five of our Trustees have served on the Community Advisory Board and other committees. In the interest of protecting the quality of Shinnecock Bay, we organized a petition against the proposed parking of Recreation Vehicles off Dune Road in East Quogue. 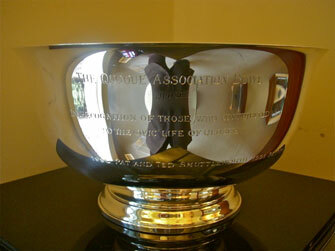 Periodically we present The Quogue Association Bowl to those who have contributed extraordinarily to the civic life of the Village through their volunteerism. In addition, we present The Humanitarian Award to members of the Quogue Police and Fire Departments who have performed above and beyond the call of duty. Each year, we present a high school student who is a resident of Quogue with our Community Service Award. The Quogue Association is hard at work at another beautification project for the Village of Quogue. We are planning a Meditation Garden on the Village Green and we partnered with the Quogue Library and the Quogue Historical Society to restore the anchor at the library. Over the past few years, we finished our renovation and landscaping of the Town Dock area, the Post Office garden and new landscaping in several different areas of the Village. We also maintain the landscaping at the west entrance to Quogue Street from Montauk Highway, at The Post Lane Circle, and at the intersection of Post Lane and Dune Road. We hope you enjoy our lovely Village! The Quogue Association evolved from the Quogue Improvement Association formed in 1905 to control the unbearable dust from the loam roads and to replace oil street lamps with gaslights. In 1929 this became the Quogue Protective Association to counter an epidemic of burglaries. In 1961 this group became the Quogue Association of today. On September 8th, Quogue Chamber Music presents Trio Solisti (piano, violin, cello) performing works of Haydn, Dvorak and Chausson at 7:30 pm in the Quogue Community Hall. Tickets for the concert are $40 (or $5 for students). To include the post concert party at the Quogue home of Mark Carbone, the cost is $100. The Westhampton Garden Club presents a talk by Paul Cowie: The Story of the 9/11 Memorial Trees September 24th, 1:00pm at the Quogue Community Hall, 125 Jessup Avenue. Open to the public at no charge. From 2005 to 2011, Paul Cowie + Associates worked as a design team specialist to landscape architect Peter Walker & Partners on the design and implementation of the tree planting at the National September 11 Memorial at Ground Zero in New York. The Quogue School Scholarship Fundraiser. Friday, September 28 at the Quogue Field Club. Golf Shotgun start at 1P. Tennis at 3P. Cocktails at 530P. Contact the school for more information. Sign up form is here. Makerspace For Kids! Friday, September 14th 3:30-4:30 pm. Make sun dials, soap -cicles and more! Call to see what’s happening for September’s class! Thursdays, 11:00am-11:45 am Storytime!Miss Pat creates exciting learning opportunities with crafts and songs! Call 631-653-4224 to register. Learn how to download and read books using your phone and LIBBY! . Join us for an easy workshop to learn how to use LIBBY, (an app) to download ebooks and audiobooks on your tablet and phone. Join us at at the Quogue Library Satellite location on Midland Street right next to the Quogue Post Office! Call 631-653-4224 to attend. Call 631-653-4224 to register. Oui, ..Learn Easy French for Travelling! Thursdays through October 6-7:00 pm Learn French for your next vacation! Sophie Séjourné came to New York City from Paris 20 years ago. For the past 16 years she has taught French privately, to both groups and individuals.. Please sign up for all six sessions! Call 631-653-4224 to register! Sunday with NPR’s David Allen BouchierSunday, September 16, 3 pm – 4 pm. NPR contributor, David Allen Bouchier will read from his humorous essays on life musings and from his memoir. Times. Call 631-653-4224 to attend. Advanced Funeral Planning September 18th 6:00 PM-7:30 PM Call 631-653-4224 to register. History in Photos: The 1938 Hurricane Saturday, September 22, 3pm – 4 pm. It’s been 80 years since the 1938 devastation from the hurricane. A pictorial history will be presented depicting this event by Julie B. Green curator of the Quogue Historical Society. Call 631-653-4224 to register. All About Katharine Hepburn Sunday September 30, 2 pm to 3 pm. A study of Katharine Hepburn’s life and work with film historian Howard Oboler. Film clips and true stories! Call 631-653-4224 to register. $2,000 is awarded annually to the high school student residing in Quogue who has demonstrated a commitment to the community of Quogue and/or the surrounding communities as evidenced by his or her school work and extra-curricular activities. For more information please, fill out this form, write us at the address below, or send us an email. The Board of Directors of the Quogue Association is encouraging you to become a member, or renew your membership to the QA. The Mission Statement of the QA is to foster the general welfare of the Village of Quogue and preserve its character as a desirable and attractive residential community. The Association has pursued this mission since its incorporation almost 70 years ago. The completely volunteer association monitors activities in the Village, advocates where appropriate, and sponsors a number of activities and projects. Member dues are still very reasonable ($40 for a single membership or family). This letter is our initial membership appeal for the year 2018. To become a member or renew your membership please go directly to our new website www.quogueassociation.org and complete the application. If you have already paid for your 2018 membership, thank you for your support. Along with the Quogue Library and the Quogue Historical Society, the Quogue Association assisted in restoring the historical anchor from the sailing ship, Nahum Chapin, that sits in front of the Quogue Library. This past year the Quogue Association brought a beautiful new clock to the Village Pond area and added new landscaping and a new fence at the Village Post Office. the intersection of Post Lane and Dune Road. The Quogue Association periodically honors our community leaders with the Quogue Bowl on display at the Quogue Library. Through the generosity of the Crowe family, we are partially funding an area of the restored Village Green in honor of Lynn Crowe, a long serving and dedicated member of the Quogue Association. This area features a lovely serpentine bench designed by Village resident, Stuart Disston. Please visit our website often and follow us on Instagram and Facebook to see additional projects in the coming months. Continue to look for our monthly newsletter highlighting community activities. We are again hosting the annual Beach Party on Friday, July 20th (Rain Date Friday, July 27th) The Quogue Association’s Duck Race is scheduled for Friday, August 10th. We would like to extend our thanks for the continuing support of our membership, and express gratitude to the Mayor, Trustees, and Village staff for their on-going help and support!